CANNIBALISM CAN RUN THE GAMUT from tribal to survival -- think the Donner Party, or Alive! by Piers Paul Read -- to the sci-fi horror of Soylent Green. * It seldom comes up** in conjunction with baseball. 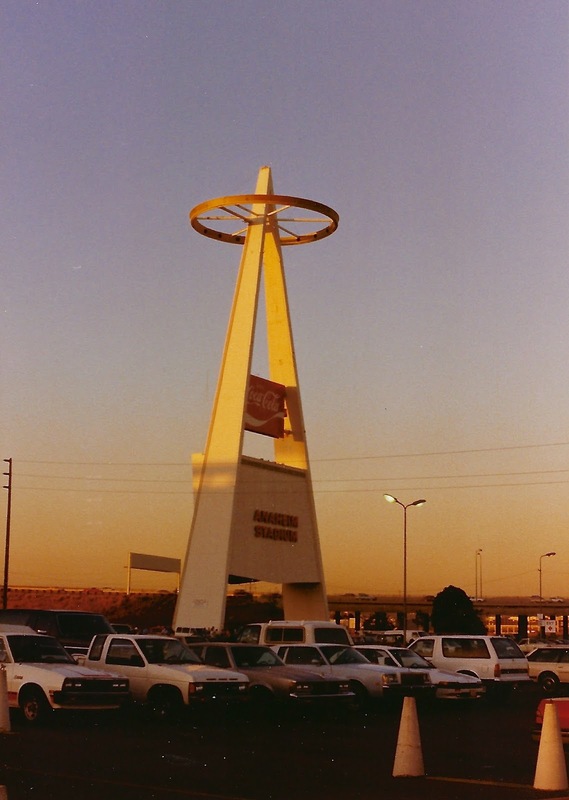 Leave it to the California Angels to fill that void. In 1987, the defending American League West champs had a new star. 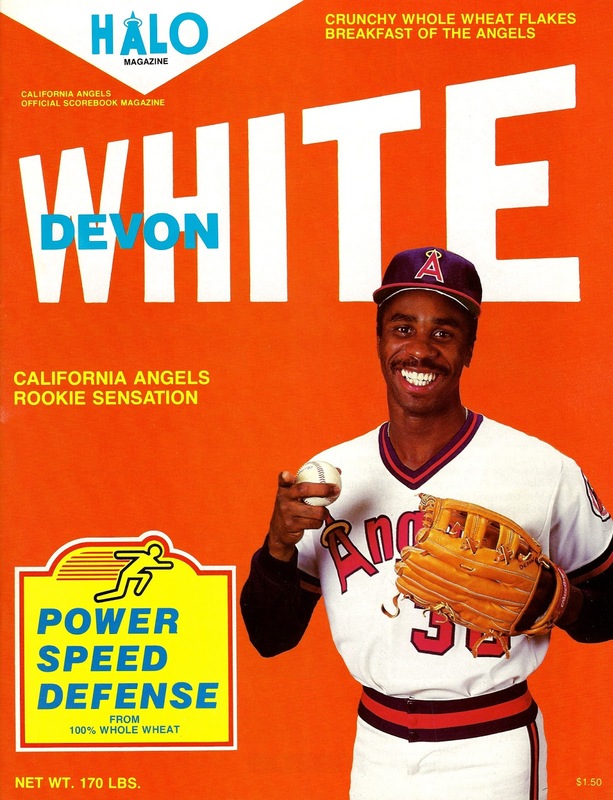 His name was Devon White, and he played one of the virtuoso glamour positions in baseball: centerfield, that place rhapsodized in song by John Fogerty. Centerfield, that verdant expanse manned by men like Tris Speaker and Joe DiMaggio, by Willie, Mickey and the Duke. Going into action on July 31, the Angels' newfound phenom was hitting a solid .284, with 18 homers, 22 steals and 64 runs batted in. That night, against the visiting Seattle Mariners, White would bat clean-up just behind the prior year's phenom, Wally Joyner, who'd finished second in Rookie of the Year balloting to the Oakland Athletics' Jose Canseco. But how best to market the multi-talented Mr. White? The Angels solution was to make him a commodity. Big league slugger Dave Kingman once said athletes were pieces of meat. California went to a different trading pit and came back with cereal. On the cover of the Halo Magazine game program, they would sell their outfielder not as an image on a box, but as the food itself. White as Wheaties, breakfast of A.L. West champions. "The crunchy whole wheat flakes breakfast of the Angels," boasted the box-mocking magazine cover. "Power, speed, defense from 100 percent whole wheat." Start your day right, with a bowl of Devon White. Net weight, 170 lbs. Kind of big to lug home from the Kroger or Safeway, but a good fit for the fully-enclosed Anaheim Stadium shared then by the National Football League's Rams. 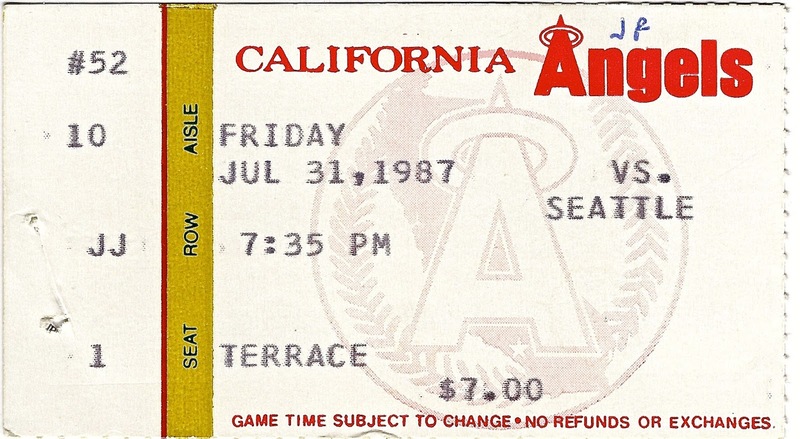 That night the Angels tattooed the Mariners, 8-2, before 32,471 people. 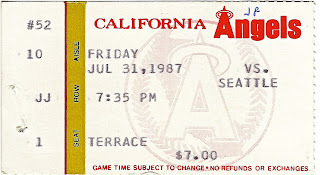 White and Joyner hit back-to-back homers off Seattle starter Scott Bankhead in the third inning and after a Mark McLemore sacrifice fly scored Bob Boone in the fourth, Bankhead exited with Anaheim ahead, 4-0. The Angels' nutritious outfielder finished the night 1-4, with that round-tripper and two runs batted in. He was also caught stealing because, well... it happens. Allowed to play out the season without being devoured by teammates, opponents or fans, White finished with slightly soggier stats than that end of July snapshot: a .263 average with 33 doubles, 24 homers, 87 RBIs and 32 stolen bases. He finished fifth in A.L. rookie of the year balloting won by the A's Mark McGwire. California would tumble to 6th place in the seven-team division, finishing 75-87, ending the career of veteran manager Gene Mauch. White played three more years in Anaheim, winning two gold gloves for defensive excellence and being selected to the A.L. all star team once before being traded to Toronto in a lopsided trade where the primary return was outfielder Junior Felix, who'd be out of the majors by 1995. He would win five more gold gloves with the Blue Jays while making the remarkable seem routine, qualify for the all star team again and be part of two World Series winners, proving more champion than breakfast. White won another title in 1997 as a member of the National League's Florida Marlins and retired in 2001 after spending his last year with the Milwaukee Brewers. He was 38. Today, he's the hitting coach for the Blue Jays' AAA affiliate Buffalo Bisons. In the Summer of 1987, soon after graduating from college, me and my buddy Chris took a baseball tour of California. Mostly baseball at least, and hell of a good time. This is the seventh part of a series inspired by those 16 days on the road.